First and foremost, you will get one free reset of an old home city. This means if your current home city in Age of Empires III is, say, level 79, and you buy the expansion pack, you can push the reset button and the number of cards you have chosen will be returned to zero. This allows players to get the cool new cards made available in the expansion pack. So, you at least get to carry over cards from on Home City. Too read the rest of the interview, visit GameSpot and comment on anything you read here. Seems a good majority of you either really want to use the new feature or will at least like to try it once The WarChiefs come out this October. Our new poll inquires: "What civilization will you play first when The WarChiefs come out?" And a thank you to Braveheart_LDS for thinking up this one. If you have any suggestions for a future poll, you may post the suggestion here. So if you want to download, or just read all the changes he made, check out the patch list. ultimitsu, the author of the "Holy Grail" Dutch strategy posted up three recs of him using the Dutch. Two of them are the four bank Fast Fortress and there is also a Double Dock Schooner boom provided as well. The first game shows an attempted strategy Stophon4 used on Great Lakes. That was ATP then use the five trading posts for resources. It is a good though, but possibly overdid it building 5 Trading Posts. He concluded banks profit more. If you have not heard of ultimitsu's strategy or want to download the recorded games, go here. The Cyberathlete Amateur League (CAL) was created in March 2001 when the Cyberathlete Professional League acquired a small online league named Domain of Games. CAL was launched with only one Counter-Strike division and has since expanded to include over sixty game divisions with hundreds of thousands of registered league members. CAL attracts both seasoned veterans of online competitive gaming, as well as gamers just starting out, and is an innovator within the online gaming community. The primary goal of CAL is to be the standard for online competitions worldwide. Registration is not open yet, but will be soon. Stay tuned for an announcement when registration opens. For more information, check Hairy Scary Man's thread. Everyone can find something useful in this. And best of all, it is free! So check out his thread here to download and comment on the file and hope he makes one for The WarChiefs! Our weekly forum party will be held on Sunday at the regular party times of noon and 7pm EST. The theme for this week is no hiring mercenaries. That means none of the Fortress age coin shipments, Industrial Age Army Shipments, Spahi, and Church card mercenaries. The only way mercs are obtainable is through the 2 Corsair and Caravel Age up and 3 Spahi age up. Ender_Ward, who is known for his Otto Fast Industrial and Power Play, made a Jannisary rush strategy up. Wait a second, can't everyone do a simple Jannisary rush, it's just send all resource crates. Well Ender has a spin on it. It is "inexhaustible," with this rush, the food and coin just keep coming. The key is two or more trade posts and Silk Road. Being able to set 2-5 trade posts to food, using 7-10 villagers to mine gold and 3-5 to chop wood (housing), we can have the rest of the villagers on food to nearly continuously pump Janissaries from two Barracks. But the strength of the rush doesn't end there. If you send Silk Road right after 5 Janissaries as you hit Colonial, every, single, crate that you send from that point on, is enhanced too. You are not powering your rush not with a 700 food and 600 food crate, but with 910 and 780 food crates. Apply the same to gold, and even more valuable ... wood. With food from the trade route and extra resources with crates you ship, the constant flood of Jannisaries wont end. You'll quickly be able to get to fortress while still making ten Jannisaries at a time. So, just not a typical Jannisary rush, it is a never ending one. Give it a read and comment on it here. It's an interesting ingame footage and released for the Games Convention in Leipzig, Germany. The ESO servers are going to be taken offline for regularly scheduled maintenance on 08/24 at 2:00pm GMT (9:00am CST). Server down time is expected to be approximately 3 hours. So don't worry if you try to sign on and can not, it'll just be down for three hours. And if you are too bored and want to do something AoE3 related, try downloading some Recorded Games and comment on the forums. With "Noob Bashing" going on and people joining a Conscript's game to get an easy win, people at www.undefeat.com/EsoTools decided to make and Noob Bashing page. This webpage shows the amount of rated games a player has played since the release of 1.08 and the bashing percent. For a game to be considered a "noob bashing" game, it must be versus a player that is at least 7 PR or more than the higher rated person. Are you curious to know who are the top noob bashers in ESO2? If so, check the site http://www.undefeat.com/EsoTools/NoobBashers.aspx. Every player has a bashing counter that's incremented for every win against a lower rated player (right now, the Power Rating difference should be 7 points). This ranking is generated once a day, around 1:00 AM GMT. Due to server constraints, I decided to remove team games processing to save resources. Only 1 vs 1 games are processed at this moment. As a bonus, I've also implemented an ELO based ranking that started with patch 1.08. So see if you noob bash or someone you recently played did it to you at ESO Tools. Our information section for The WarChiefs is completely updated with all of the latest information on the upcoming Expansion Pack. Iroquois, Sioux, Axtec, and European units, shipments, and techs have been updated so we can expect what to see this October. If you are wondering about what features will be in The WarChiefs or anything about it, go to our WarChiefs section to read about it all! Interesting changes so far, he will update it again if he finds it necessary. If you wish to, discuss and comment on the changes thus far in his thread. And if you like it enough, download the fan patch here. Looks like a lot of you are playing Brits, while few are playing the once top civs in patch 1.07, Portuguese and Germans. Now we are wondering, "What do you think of the new Revolution feature available in the Expansion Pack?" If you are not sure what the new Revolution feature does, browse around our WarChiefs page to get all the information about the Expansion Pack! And a thank you to Novoa20 for coming up with the idea for this poll. "No Sync Errors! From 2.0 onwards, no fix map will be needed after a game of Fort Wars! Fort Wars no longer causes no errors after the game, and in fact, will fix any sync errors from previous versions!" "Fort Wars" is a very popular single and multiplayer random map. 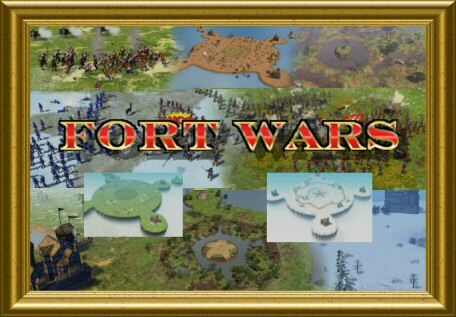 In "Fort Wars", each player starts with a single Fortbuilding. This is where you receive units for free or from purchase.You lose if your fort is destroyed. Kill all enemy forts and you win. Our weekly forum party will be held on Saturday at the regular party times of noon and 7pm EST. The them for this week is no using a British Home City. thay's right, no longbows massing for anyone! Bruce Shelley has posted another entry on his blog. He mentions amongst other things the progress of the work on the expansion pack The WarChiefs, which is progressing towards a zero-bug release, aiming to make the game bug-free. This building, new for the X pack, allows you to build native units that have been unlocked by building a Trading Post at a Native Village. The native pop limit that applies to the Trading Post applies to your embassies, as well, but they offer you the opportunity to build natives at a more strategic place or to build them more quickly (simultaneously at multiple places). The Native Embassy is more useful on some maps (and has obviously no use on the Patagonia map where there are no native villages). In an earlier iteration, the Native Embassy allowed you to build villagers. This proved too powerful for booming strategies. Expert Russian player BLuE_GaiDeN posted a Russian Micro Guide for Dummies at GameReplays.org. He provides screenshots and different scenarios to show and explain each instance. Hello, I am writing this guide to give you some tips and tricks about micromanagement (which is commonly referred to as "micro"). These few illustrations can really improve your game a lot if you start doing these things every game. You need to practice it to perfect it. If you master these few tactics that I am about to show you, it will then open up your mind to allowing you to be able to micro on your on and hopefully greatly increase your rating. You will have a definite advantage over your opponents if you practice these types of tactics in every game you play. If you start using these tactics in every game you play, you will soon start to see improvements in your skill level and hopefully in your PR or cuetech rating. It works for all civilizations, he just uses Russian examples. So if you want to improve on a little Micro, read his strategy at GameReplays.org and discuss it in the thread that rel4xed made. Build forward barrack and 2 houses with the 400 wood, send 3 hussars. Keep making skirmisher and villagers - you can afford it. Start rush as soon as you have 5 skirmishers, don’t bother siege anything, just kill whatever he has, keep hussars out from TC range, if you have to kill vils inside TC range, use skirmishers, they are replaceable. Your skirm + hussar should be able to handle any colonial shipment he has, and as long as he is not producing hussars locally, you should be OK.
Next shipment can be 8 pikes or 700wood. Use 8 pikes if he is turtling instead of fighting it this rush, or if he is relying on a TP for his shipment. To accommodate 8 pikes and vill growth you will need to chop wood and make 2 more houses. Then it's up to you and the situation pretty much! So give it a try and post any suggestions or comments here. Multiplayer Scenarios in the Future? I realize that MP scenario support is important for the longevity of a game, no one needs to convince me or Ensemble Studios of that. I believe that I and several members from ES have mentioned their support for the feature many times in various forums. As you mention, just look at the AOK/TC and AOM/TT online numbers and it’s obvious that many players still play those games for the scenarios. Are you going to have this feature? At this stage I don’t know the answer to that question. We have talked about it a number of times, and I will certainly be bringing it up again when it comes time to talk about patches. I hope ES considers adding this feature in a future patch/expansion pack. I'm sure a lot of you have wonderful memories of crazy multiplayer scenarios for Age of Empires II. Wins per Map shows you which civs have more wins on specific maps. For instance, British and Ottomans dominate Amazonia, while Ottomans (which have a very good win percentage on all maps) have far more wins on Carolina than other civs. New England seems to be the most balanced map; no civ has a higher win percentage than 20%. With the Played Maps tool you can see which map was played more often than other maps. Great Plains is with exactly 14% most popular, while nobody likes to play on Bayou (0,4%). All other maps seem to be very even, with a percentage of ~5. 18) The trade monopoly victory; do you think it would be too easy to achieve this on the patagonia or great lakes map? A- nope. You still have to own more than half the trade sites (that includes settlements as well as trade routes). On Patagonia or Bayou you have to own 3 of the sites. The enemy only has to destroy one of them to stop your timer, and lo and behold you’ve lost all that money (invested in the Trade Monopoly) for nothing. 44) Will there be other mines than "only" gold and silver? A – I believe we now have copper, and possibly tin. 79) Can travois turn into TCs? A – the Iroquois special travois cannot become a TC or a TP. Also check out Botolf's Sandy Speaketh thread! ultimitsu, a forumer who just loves to make strategies with abbreviations made yet another strategy using the Dutch. The DUN is a strategy for the Dutch that does not require banks! It's a rush without the need for coin for skirmishers or hussars. In other words, the Native Rush is back. You only need a handful of settlers on coin to keep villager production up while sending Native Treaties and making Native units to attack the enemy. * Gather gold, build a house, make 6 vils, age with 13 to 400wood. * Send ATP as first card, chop wood ASAP once aging began, and build 1 Native ATP. * Keep mining going, make sure you have constant vil production. * Arriving on age2 at 4:07~4:10, collect wood and build another Native ATP and 2 trade route ATP. * send Native American Treaty, it arrives at 4:50. Start attacking as soon as they arrive. * split new vils between food and wood, you need 6 vils on gold to keep constant gold production. * Keep Envoy scouting between his base and the remaining native settlements. It's a straightforward strat and he provides an explanation on several native units and their part in the rush. You can both read the strategy and comment on it in his thread. In the last few weeks RF_Gandalf released several cool new random maps like Transcontinental; a rectangular map with players starting on opposite shores of a large continent, with randomly varied features, Barrier Ridge; a defensive map featuring a central mountain ridge with only one pass and Mountain Pass, a rectangular map featuring a central mountain range with only one pass through the peaks. Check out the Random Map Scripts Download Section for more info! Check out the new Homecity Gallery in the Modding Forums! Lord Tahattus created a thread where you can post your own modded Homecities and look at the amazing work of Mods like "The War of the Triple Alliance" and "Napoleonic Era"
The flags shown in the Screenshots are part of Lord Tahattus' Pack of Quality Flags. The new Homecities he created are also part of this modpack. If you liked one these, maybe even thinking about making it a new civilization, you can contact him in the forums. The third season of the RTS League started this monday and their new media team has already written complete previews for each of the 9 divisions with clan information and background, past results in RTS League and predictions for the coming season. Also, there's an extensive interview with [hope]Finn, the clan leader of Season 2 winning clan, providing a lot of insight into what's going on in clan playing at the moment. The previews and interview can be found here at RTS League forums. Age of Empires III for the Mac! The sequel to MacSoft’s second best-selling title ever, and the latest release in the 18-million unit “Age of Empires” series, “Age of Empires III” for Macintosh is scheduled to be available by the end of September, 2006 as a Universal Binary that can be operated natively either on Apple’s Intel-based or PowerPC Macintosh computers. “Age of Empires III” picks up where “Age of Empires II: The Age of Kings®” left off, as players become one of eight European powers exploring, colonizing, and conquering the New World. Featuring amazing 3D graphics, remarkable Ageia® PhysX® technology, and an innovative Home City feature that lets players “level-up” their evolving home city to strengthen their economy, technology, and military, “Age of Empires III” for Macintosh sets many new standards for real-time strategy games. Players command rifled infantry as they scatter soldiers and blast buildings with cannon fire. They direct cavalry through the plains, and navigate naval fleets to hold strategic waterways. They explore uncharted territories, grow a booming economy, and form strategic alliances with Native Americans as they stake their claim in the New World. More info at MacSoft's website. Ruthless__ wins New World Tournament! Many congratulations to Ruthless__ who defeated StarSky 2-1 in a keenly contested Spanish mirror in the final round, winning the first prize of $750, with StarSky receiving $150 for being the runner-up! All the recorded games from the tournament, including the final can be found here, as can a recording of the live audio broadcast done for the final matches! Also, don't forget to congratulate the winners in the forum! Also many, many thanks to Ensemble Studios for kindly sponsoring us $1000 for the prize money for the tournament. You guys rock! What, even more information for this week?!? Gamespot have updated their The WarChiefs section with lots and I mean lots of new videos and information. For more detailed dissection of the new information why not join us in our The WarChiefs forum and discuss with other Age fans! Thanks to King_Ali_Skahir for the info! Well with the announcement of the Aztecs comes the amount of information after that. IGN has an article about the Aztecs and it is quite interesting. The Aztecs will be unique. First of all, they are an all infantry civilization: no cavalry, no artillery. They also start off with a Warrior Priest, this is just a buffed villager that can be tasked on the fire pit. It "gathers" at the rate of two villagers, but only counts as one for the 25 settler fire pit limit. Moreover, the WarChief for the Aztecs has a special attack that deals damage to nearby units. Their military units are not divided into foot vs. mounted vs. siege, but instead they are organized by social rank. The Aztec War Hut is used to train ordinary warriors drawn from the ranks of commoners. These include the sling-armed Macehualtins who are used like archers to counter heavy infantry, Puma Spearmen who are especially effective against buildings and Coyote Runners who are a sort of fast-moving "foot cavalry". Finally, they have late game shipments that can be sent repeatedly. So, it will be a bigger boost than being able to send 300 wood over and over. You can take a look at the final civilization announced here. Also, a thank you to omicron1 for seeing the article. You can discuss the new information in his thread. "The 63 MB download contains all the means necessary to help"Age of Empires III" fans build a fan site in preparation for therelease of "Age of Empires III: The Warchiefs" expansion. The kitcontains concept art, forum avatars, screenshots, desktop wallpaper,and much more. Due on store shelves in the Fall of 2006,the "Age of Empires III: The Warchiefs" expansion pack will build offof the exciting real-time-strategy gameplay of "Age of Empires III,"providing players with the ability to lead one of three proud NativeAmerican civilizations to expand their empire and fight for control ofthe Americas." Let's go and check out the Fan Site Kit! A congratulations is in store for StarSky and Ruthless__ because they are the final two in the New World Tournament. But who will win the $750? Well you can be one of the first to know tomorrow (Thursday) at 15:00 GMT. Their three games will be played on Observer Mode maps with me broadcasting on the teamspeak.heavengames.com TeamSpeak server. For details go here. Also, congratulations to Finn and Black_ice_Spain for placing third and fourth, or vice versa. they will play tomorrow to determine who gets what place. We have a new cherub at AoE3H! I'm delighted to announce that Kastor will be joining the staff here. He'll be working hard for the new Warchiefs expansion pack and will be also be helping with SD and site maintenance. You can offer your congratulations here in this thread. The third civ for The WarChiefs is the Aztecs! Gamespy have posted a new, very detailed preview article on all three native civilizations, including confirmation of the Aztecs as the third civ. The Aztecs will be an exclusively infantry-based civilization, in stark contrast to the cavalry-heavy Sioux. If you're in the mood for some discussion why not contribute to the Aztecs thread in our The WarChiefs Discussions forum! IGN have also released a new in-depth article focusing mainly on the Iroquois' part in the single player campaign, and also mention other new developments for The WarChiefs expansion pack! The article has some extremely detailed information on the single player campaign, and also mentions a new victory condition called trade monopoly, where players have to control a number of trade posts for a certain amount of time to the win the game. Dicuss it further in the forum thread! We all know Sandy has been letting AoE3 players ask him any question they feel like over at Age Community, but expert WaCkO who was able to playtest The WarChiefs down in Dallas at Ensemble Studios is allowing forumers to ask him questions about the Expansion Pack. Granted, he obviously can not release the third civ or any brand new information, his opinions are interesting nonetheless! So if you have any questions or just feel like reading, visit the thread. Well an overwhelming amount of you thought that the Aztecs are indeed the third and final civilization in The WarChiefs Expansion Pack. But, there is no official release from Ensemble Studios yet so we'll have to wait, although it certainly looks like we'll be playing and facing the Aztecs come this Fall. Our new poll is asking what civilization you mainly play now that 1.08 is out. Just a Player stumbled upon some interesting statistics at http://aoe3.de/esports/ recently. It shows the percentage of games that last X amount of minutes. Apparently, fourteen percent of all games end before two minutes. I guess quite a lot of people dislike the matchup they see or map. The highest percentage is games lasting 15 to 20 minutes taking in 15.49 percent of all games played. And games lasting over 90 minutes are 0.81 percent. So take a look for yourself. Also, you can do all sort of thing on e-Sports. Such as looking at the General ESO info. Wow, 238,132,595,258 food has been collected. You can also compare stats, so compare yourself to a clan mate or fellow forumer! If you wish to discuss these stats go to Just a Player's thread. Lavamancer20 noticed that Age of Empires III is nominated in the Best Strategy Game of 2006 category for G-Phoria. As you may or may not know, G-Phoria is an award show for video games hosted on G4 (Gaming Show Channel). They recently released their nominations for all categories and Age of Empires 3 is up against Empire at War, Battle for Middle Earth 2, Fire Emblem, and Advanced Wars. So register and vote for your favorite game here and you can discuss G-Phoria in Lava's thread. The them for this week is Canadian/Northern USA maps. So all Forum Party games shall be played on Saguenay, Yukon, and Great Lakes. If you're a Scenario Designer you've probably heard of the "megaproto." The MegaProto is a Proto.xml file that makes some changes and allows designers to make use of previously hidden units/objects on the scenario editor. Modder twoqtimes2 posted an update to the megaproto at our forums, so if you've used it before you might want to update it :). You can download the MegaProto here. What Do We Know About Stealth? Discuss and speculate at our forums! Possible Release Date for TWC? As fhertlein points out at our forums EBGames has started to accept pre-orders for The Warchiefs expansion. The release date listed on the site is of October 2nd. Should this be a trusted release date or not (though it usually is) we're yet to see, but it all seems right to release at that date. Yet another installment of Bruce's blog (a developer on The WarChiefs) has been posted for all Age fans out there. Bruce mentions how The WarChiefs is nearing the final stages of balancing and polishing before release and has some interesting comments on the revamping of E3. He also mentions how ES will probably show off the x-pack at the Leipzig Game Show and have a demo available for anyone attending to have a go with. If you feel like talking about the blog, do so here! RTS League Season 2 reached its conclusion when hope clan defeated ViE 2-0 in the finals. The third place was decided in the matchup between BTG and StR, with StR winning in a 2-0 victory. Noteworthy in hope's victory was that it only lost one game during the whole season, against StR in semifinals. Congratulations! The final brackets can be seen here and the recorded games of the whole playoffs can be downloaded by clicking the INFO button below each matchup. Forumer RiderOfEternity noticed that GameSpot's live show, On the Spot, looked into new games and trailers earlier today. One of these games was, of course, Age of Empires 3: The WarChiefs! Coming up next, On the Spot...Mario and company take it to the hole with a look at Mario Hoops 3 on 3 for the Nintendo DS. We're then off to restore the color balance in Capcom's anticipated Okami for the PlayStation 2, check in with 50 Cent and the G-Unit on the PlayStation Portable, and give you a look at the world-exclusive premiere of the Medal of Honor: Heroes trailer. Plus, check out the new action on Ninety-Nine Nights, Age of Empires III: WarChiefs, and more! So be sure to check it out and see if they reveal any new information. It cover the general things, like 6 new maps, 3 new civilizations. But it looks like the saloon lets mercenaries come out really fast. You can watch On the Spot here and discuss what you saw on our forum. So far forumers think that the video proves Aztecs are the third civilization with images they saw. Help ES Improve the Scenario Editor! ES_Thunder has posted on our forums a request to report editor bugs, so that they *may* fix it. Gaurdian_112 has put up a thread with a list of bugs he recalls from his head, but you can help too. Please visit Gaurdian's thread and contribute with DETAILED descriptions of every bug you found while using the editor, as well as things that would greatly help designing with the new editor. If we give enough detail and beg enough, Ensemble may as well fix the editor and give us a great tool to design with. Age of Empires 3 Heaven's staff have been hard at work compiling the info released for The WarChiefs Expansion Pack. So far we have up to date information on what is suspected and proven to be in the Expansion. Of course, forumers from The War Chiefs Expansion Discussion Forum were are great help with all of their threads and speculations, so a big thanks to their hard work! So, if you know little about The WarChiefs, you will have a place that has all of the information so give it a read here! Comments and give suggestions or new information in the thread. was it really intended that the Aztecs will be known to public this way? So is ES trying to hint us at the third civ or are they just messing with our little heads? Whatever it is let us know what you think at Kastor's forum thread. Forumer MNBob has updated his units chart for the 1.08 patch. It has been updated for the altered training times units have, change the Mayan Holcan Spearmen siege attack that was nerfed from 60 to 45, 1.5X bonus LI have versus range cavalry, uhlans doing less damage to settlers, Great bombard, Heavy Cannon, and Rocket doing less damage to artillery, and +10% hussar hitpoints. Great job MNBob! And of course, there are links to previous unit charts so you can compare with the other patchs. You can view the chart here and comment on the forums. ESO UI updated to support WarChiefs expansion. Clan roster will now properly display the last login date of your fellow members. The Clan Information section from the Home Cities tab will properly reflect clan changes. The Statistics section from the Home Cities tab now truncates Points to 5 decimal places, breaks apart large number appropriately for your locale (i.e. commas for English, 1,000,000), applies the appropriate percent sign for your locale (i.e. % for English) and displays zero (0) when there is no numeric value available. Negative values for Points are displayed as 0. The friends/pests limit has been increased to 80. Friends list should now properly display online/offline status. Previously, certain phases of the moon and black cat movements caused the updates to be ignored. Is it me or is 1.08 the most eagerly awaited patch ever?